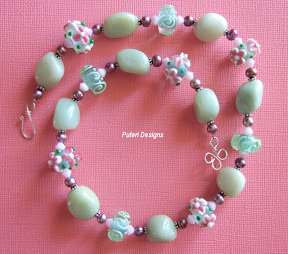 Lampwork beads make such beautiful additions to a necklace or a bracelet. I bought all these lampwork beads at ebay. 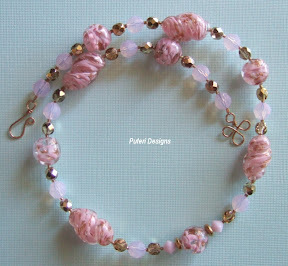 These venetian beads came from a broken necklace that my mother-in-law got from a thrift store. 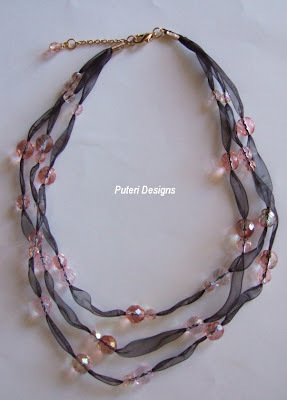 Re-string them with gold/clear czech galss beads, rose water opal swarovski crystals, rose opal swarovski crystals and you get a knock-out of a necklace! I heard this on the radio this morning. I am never ever going to fly Air China!! As it is, I am always very tense when I have to fly any where. Imagine if I was flying in a plane where I know the pilot does not speak much English and therefore is not able to understand what the air control tower is saying? That would be terrifying. On my last trip home to Malaysia we flew Cathay Pacific and I was happy to note that the pilots were native speakers of English. Many years ago when I was teaching in Vietnam, one of the guys in my class at the Research Institute of Fruit and Vegetable was an air controller. He said it was important for him to be able to speak English because among his job was to communicate with planes that fly over the Vietnamese air space. I said, "Oh, I see." What is it with a lot of the products that come from China? Have you heard about the toothpaste that is made in China and available at most of the dollar stores here in the US? I buy my toothpaste from the 99 Cents store but thank goodness I have never bought any that came from China. One of my kids love to eat the toothpaste off her toothbrush! Imagine your kid consuming some anti-freeze agent! And now the warning is on the safety of the seafood from China. I buy a lot of shrimp or fish that is either from Vietnam or China. Shudder! It is laughable when I heard on the news today that the Chinese government guarantees the safety of their food products. Who is doing the guaranteeing? They do not have agencies like the FDA that regulate the safety of food and drugs. When I was home in Miri late last year, I talked to a friend who was working in China. We talked a bit about China and about how impressed he was with the economic growth of China and how soon it will overtake the US as the biggest economy in the world. That may be so, I said, if China remained intact as a country. He told me that the grassroots political movement in China was strong and that everyone was united in the economic success of the country. Oooooookk! Whatever it is, I will never be able to view the Chinese government without suspicion. Just the fact that the government is still run by communists is enough to keep that suspicion. In my mind they view the US as a useful trading partner, but the US will never be an ally. MUAR: The Home Affairs Ministry has once again advised those who marry foreign women to go personally to the National Registration Department to register. Its deputy minister Datuk Tan Chai Ho said they should never seek the services of middlemen who could be members of syndicates, which preyed on Malaysians seeking foreign wives. He said the authorities has identified one such syndicate, which issued fake marriage certificates to married couples and the marriages were also not recorded with the department. "We have warned Malaysian men who wanted to marry foreign women to go personally to the department to register their marriage. "This way their children will have Malaysian birth certificates and will be regarded as Malaysians," he said after attending a gathering here on Wednesday night. Tan said those who married through the middlemen - and later found their children could not apply for birth certificates - could apply to adopt the children. He said through this way the children would be given permanent residence status while at the same time the couples could apply for marriage certificates from the department. He said unless the fathers adopted the children, the children would be named after their mothers and would have the same citizenship as that of their mothers. When it comes to recognizing marriages between Malaysians and their foreign spouses and the rights that ought to come with any marriage, Malaysia is sooooo backward. Why should children be the victims of their parents' mistakes? Why should couples be forced to "adopt" their own children just to correct a mistake? Afterall the father is known to be a Malaysian, and the "mistake" that was made (by marrying through a middlemen) was easily rectified by re-registering with the NRD. This statement, "unless the fathers adopted the children, the children would be named after their mothers and would have the same citizenship as that of their mothers" has got to be the most ludicrous I have heard. Does that mean even when the father claims that the children are his, they are still only allowed to carry their mother's name unless he officially adopts them? Change the laws to reflect the realities of the now common marriages between Malaysians and foreigners occuring in the country! This has got to be one of the most ridiculous stories I have heard about global warming recently. Yesterday on the NBC's Nightly News with Brian Williams, there was a news segment about a bumper poison ivy crop this year. The culprit for the bumper crop? Global Warming! The increased amount of carbon dioxide in the atmosphere is making the poison ivy grow more aggressively. Well! What do you know! Are there any complaints about other green plants that are growing better because of the increased amount of carbon dioxide in the atmosphere? Nooooo! And then there is this radio and TV commercial by California's ISO Flex Your Power energy efficiency marketing and outreach campaign. The idea of our leaving our kids and grandkids a world that is experiencing the effects of global warming because we didn't do enough about it is ridiculous. Yes, yes, the earth's temperature has gone up a degree celcius or so. But it is not a given fact that the earth is going to stay that way forever. One of the questions I have been asking is if we are dead certain that there is going to be a serious crisis because of global warming, why are we wasting our time trying to do things that will not have any significant impact on the earth's temperatures, instead of doing something like try to come up with solutions that will help us live through global warming without having to alter our lifestyles drastically? For example, if global warming is going to cause serious droughts in a lot of places, why are we not trying to do something about using sea water to irrigate our farms and provide the water we need if rivers do dry up? How about those ice bound places in the world? What about planning on using those places to grow our crops so we won't be faced with food shortages due to devasted farmlands? It is hard to get people excited about doing something to reduce global warming when people have no idea what exactly it is going to be liked. Man is adaptable, and if we do indeed have to live through global warming, I am sure that we would not just sit around and moan about our situation. We will do whatever we have to do to survive. This article called Read the Sunspots by R. TIMOTHY PATTERSON is something to ponder about. The relationship of the fluctuating sun's brightness and the temperatures of the earth were clearly evident by the analysis of the coring samples taken from the bottom of deep Western Canadian fjords. According to Patterson "Solar scientists predict that, by 2020, the sun will be starting into its weakest, Schwabe solar cycle of the past two centuries, likely leading to unusually cool conditions on Earth." The science of climate change is not settled yet eventhough many would like to think so. In the words of Patterson, "Climate-change research is now literally exploding with new findings". 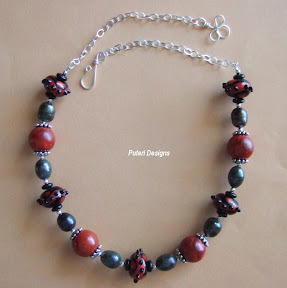 This pair was made to match the carnelian-lamp work necklace that I'd made earlier. 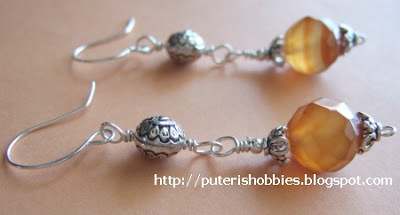 I used sterling silver caps with the carnelian faceted beads, and also a hollow sterling silver bead at the top half of each ear-ring. 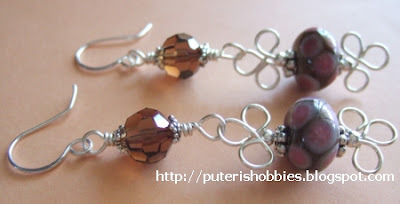 The wire and hooks are also sterling silver. 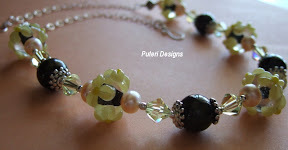 Swarovski crystals paired with lamp work beads. 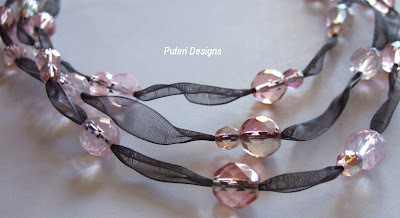 The hooks, bead caps and daisy spacers are sterling silver but the other wire work is silver colored copper. 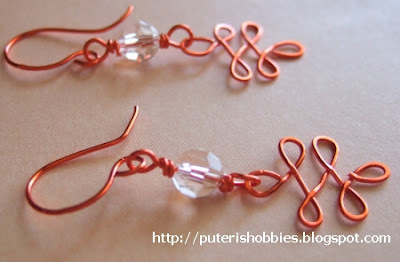 Tangerine colored copper wire and swarovski crystals make this funky ear-rings.